Since last fall I have been developing and teaching a ‘Process and Skills’ online class for graphic designers. It has been an opportunity to reflect on my teaching practice and evolve with new educational digital tools. I have taught this class on campus for several years. The syllabus, created by Katarzyna Gruda, is very hands on and require students to experiment with manual skills such as collages, book binding and three dimensional model making. One of the challenge in the online syllabus was to recreate the book binding workshop which traditionally takes place in the classroom with the help of a book binder guest instructor. I approached Scott McCarney, a book artist and experienced book binding professor, to be a guest lecturer and collaborate on an online book binding workshop. I wanted the workshop to be as complete as the campus one and integrate the making of three different book binding techniques. 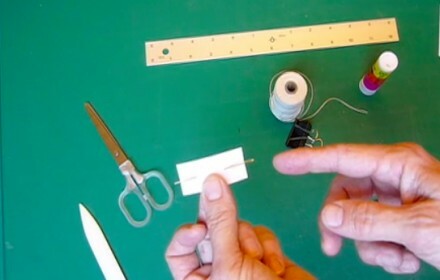 From his home studio Up State New York, Scott McCarney created and shot a series of step by step instructional videos demonstrating the making of a three holes pamphlet stitch, a concertina album and a Japanese stab binding. I was happy to see the excellent quality of the work when the students posted photos of their books to the online class. I realized that delivering the workshop online had a great advantage: students can follow it at their own pace. 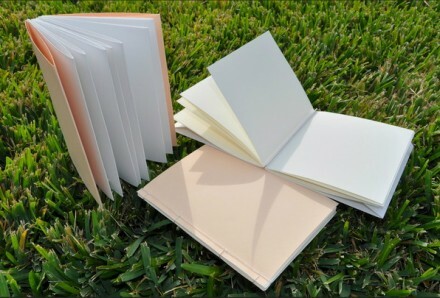 They have as much time as they need to review the techniques and therefore their sample books are very finished and professional. On campus, the workshop lasts 2h40 min. and it is a race to cover three binding techniques. Although I strongly believe communicating knowledge to students is more fluid when you are physically in the same space, this experience proved that digital communication can be a valuable teaching tool . This was an great hands on learning experience. Thanks again Scott for the great instructional videos. And thank you Jeanne for putting together this great online workshop. I agree being able to do this workshop at your own pace online and being able to refer back to the videos as needed really helped me really understand how to properly bind books in these different methods.